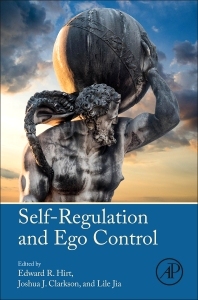 Self-Regulation and Ego Control examines the physiological effects of depletion, the effects of psychological variables in self-control depletion effects, the role of motivational and goal states on self-control depletion effects, and a number of cognitive perspectives on self-control exertion. This insightful book begins with an introduction of self-control theories, ego depletion phenomena, and experimental examples of research in self-control, and concludes by delineating more inclusive and comprehensive models of self-regulation that can account for the full spectrum of findings from current research. In recent years, researchers have had difficulty identifying the underlying resources responsible for depletion effects. Moreover, further research has identified several psychological and motivational factors that can ameliorate depletion effects. These findings have led many to question assumptions of the dominant strength model and suggest that capacity limitations alone cannot account for the observed effects of depletion. Self-Regulation and Ego Control facilitates discourse across researchers from different ideological camps and advances more integrated views of self-regulation based on this research. Facilitates discourse across researchers from different ideological camps within the field. Researchers and students in social, cognitive, and clinical psychology, and neuroscienctists with an interest in self-regulation and self-control. Clinicians and researchers who work in addictions, eating disorders, and motivational and sensitivity training will serve as a secondary market. 13. What Does Ego Depletion Reveal About Self-Control? Edward Hirt grew up in Cincinnati, Ohio. He earned his B.S. from the University of Dayton and completed his PhD at Indiana University, under the mentorship of Steven J. (Jim) Sherman. After positions at Penn State University and the University of Wisconsin-Madison, he returned to Indiana University, where he is now Professor. He has served as Associate Editor of both JPSP and JESP. His research interests include self-regulation, self-protective behavior, social cognition, and judgment/decision making. An avid sports fan, he finds creative ways to work sports into his research and teaching. Dr. Joshua John Clarkson (Ph.D. in Social Psychology, Ph.D. in Marketing) is a consumer psychologist who specializes in the areas of self-control, persuasion, and expertise. His research has been published in various top-tier outlets within the domains of psychology and marketing, and his findings have been featured in media outlets from business magazines and news articles to pop-psychology books and edited academic volumes. He is currently an Assistant Professor of Marketing at the University of Cincinnati.